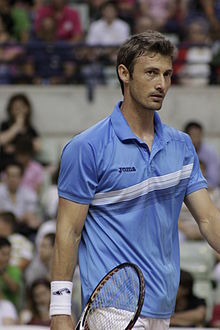 Juan Carlos Ferrero Donat (Spaingie pronunciation: [xwaŋ ˈkarlos feˈreɾo ðoˈnat]; born 12 Februar 1980) is a retired professional tennis player, an an umwhile warld no. 1 player, frae Spain. This page wis last eeditit on 17 Februar 2016, at 03:38.